Is The S&P 500 Correction Underway? 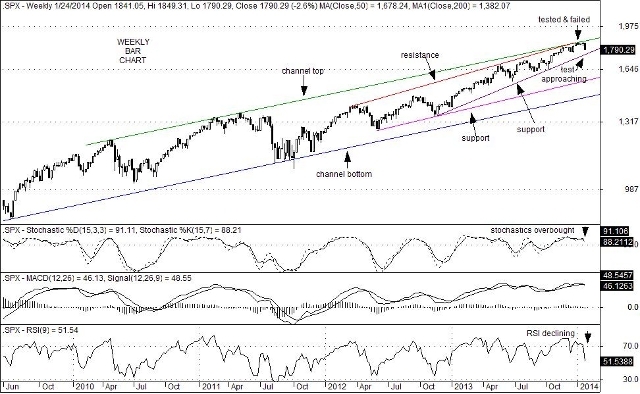 After failing to break above key channel-top resistance at 1,850.84 on January 15, the S&P 500 Index (SPX) has fallen by 60.55 points through the close of Friday. That decline represents a modest 3.27% setback thus far but feels worse because of its abruptness. Technically, one key problem is that overbought conditions on weekly charts remain in place along with the fear that troublesome economic conditions in China, South America and Europe could dampen growth expectations in the U.S. While the current 3.27% pullback in the SPX is relatively mild, further declines in the equity markets could nevertheless test investor confidence. A solid break below trend line support at 1,757, for example, would be another negative that could raise the angst of the bulls particularly since a number of recent earnings reports have revealed lackluster top line revenue results. That being said, there are a number of economists who have upped their Q4 2013 GPD estimates which, in turn, suggests that fears of a slowdown in domestic economic growth might be overblown. Still, a solid break below 1,757 could give buyers reason to pause and wait for prices to fall to more attractive levels. Interestingly, the next key support to focus on (below 1,757) sits at 1,573, but rises over time. If reached, that level would represent at 15% decline from the January 15 high and could be just enough to whet the appetite of investors who did not participate fully during the surge of 2013. Now that the Dow Jones Transportation Average has broken above key resistance to new all-time highs, it is important that the Dow Jones Industrial Average stages a similar breakout to confirm the bullish trend. This confirmation relationship is a key principle of Dow Theory. A break above 16,588.30, or preferably above long-term trend line resistance at 16,610 would do just that. 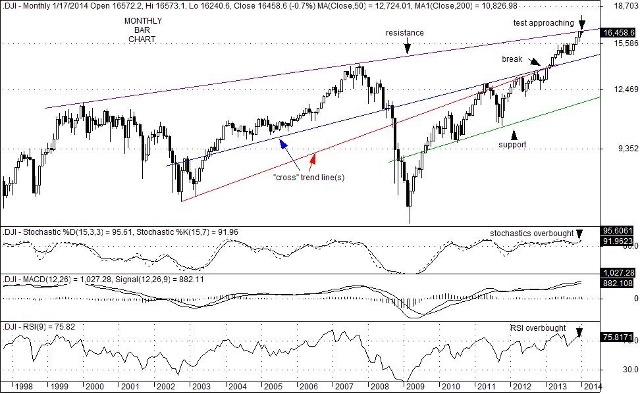 If it turns out, however, that the Industrials do not breakout and confirm the path of the Transports, the resulting divergence could trigger the much-anticipated correction that many investors have been expecting or even hoping for. Nevertheless, many signs continue to show that the economy is in good shape and is growing at a slow, but steady pace in the 2%-to-3% range. Fewer layoff plans by businesses and a general decline in weekly jobless claims add to optimism that 2014 could prove to be another good year. With earnings season at hand however, there have been a number of corporate earnings reports that have thus been considered to be lackluster. One common theme seems to be the absence of top line revenue gains with stepped up cost-cutting efforts instead underscoring the current profit picture. In light of this and the tapering plans of the Federal Reserve, any hint of a stall in economic growth could result in a period of increased volatility. The Fed has maintained that policy decisions going forward will be data-driven. As a result, this earnings season could hold a good deal of sway with investors, the averages and the Federal Open Market Committee. Interestingly, a period of increased volatility, if it were to emerge, might send investors back into the fixed income markets and blunt the recent rise in interest rates. Such an outcome would likely be a plus for the housing market and for housing stocks. At the moment, inflation is low, U.S. dependency on imported oil is diminishing and the employment picture is improving. Couple this set of circumstances with the fact that many investors remain under-exposed to the equity markets and a positive long-term outlook begins to emerge. Thus, any near-term setback in equity prices, even if it is sharp, might present an interesting buying opportunity. You are currently browsing the Charted Territories blog archives for January, 2014.